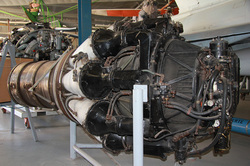 The Rolls-Royce RB.37 Derwent is a 1940s British centrifugal compressor turbojet engine, the second of their jet engines to enter production. The Derwent is a much improved version of the Rolls-Royce Welland, and the company inherited the Derwent design from Rover when they took over their jet engine development in 1943. Performance over the Welland was improved, and their reliability dramatically so, thus the Derwent became the chosen engine for the Gloster Meteor and many other post-World War II British jet designs.